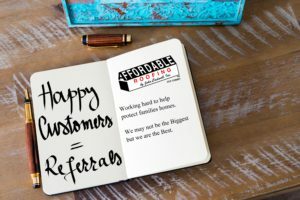 Roof Referrals – Refer-A-Friend is our way to “thank” our customers for referring us to their family, friends, and co-workers but you do not have to be a prior customer to participate. We’ve enjoyed working with you and we appreciate your business. We are not only the Best Roofing company in the Orlando area but we also have the Best Roofing Customers! By telling someone you know about your great experience with Affordable Roofing by John Cadwell, Inc. and forwarding their information to us. You and your Referral may receive a reward! Form must be submitted prior to referral receiving estimate. Forms submitted afterward will not be valid for reward. What you get for your referral*? What your referral will get?